Before launching Muddy Paws Adventures, I had the most faithful hiking companion in my dog, Charlie. However, daily hikes in the woods has nurtured Charlie’s inner-Beagle. Charlie is now forever testing me with his new found love of tracking every animal scent in Hants County. But thanks to his solo-tours in search of bunnies, I now have technology on my side. 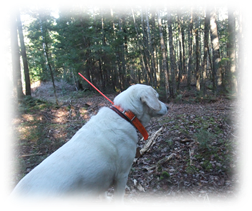 After the first time Charlie went MIA on the trails, I was offered, on loan, electronic tracking collars and GPS collars from an equine/canine club I belong to. I took full advantage of this generous offer and now every Muddy Paws dog is equipped with a tracking or GPS collar while on the trails adding another level of peace of mind for my clients’ humans. So, while my own dog may be the worst behaved on Muddy Paws hikes, Charlie’s indiscretions have served a greater purpose. You know what dog spelled backwards is!